It’s September, and that means apple season. My family and I went apple picking over the weekend and collected four bushels of sweet Honey Crisp apples. In addition to eating plenty of fresh apples, we enjoy baking them into things like muffins, cakes, cookies and cinnamon rolls. This year I decided to turn some of our harvest into a delicious Whole Grain Apple Crisp Yeast Bread. 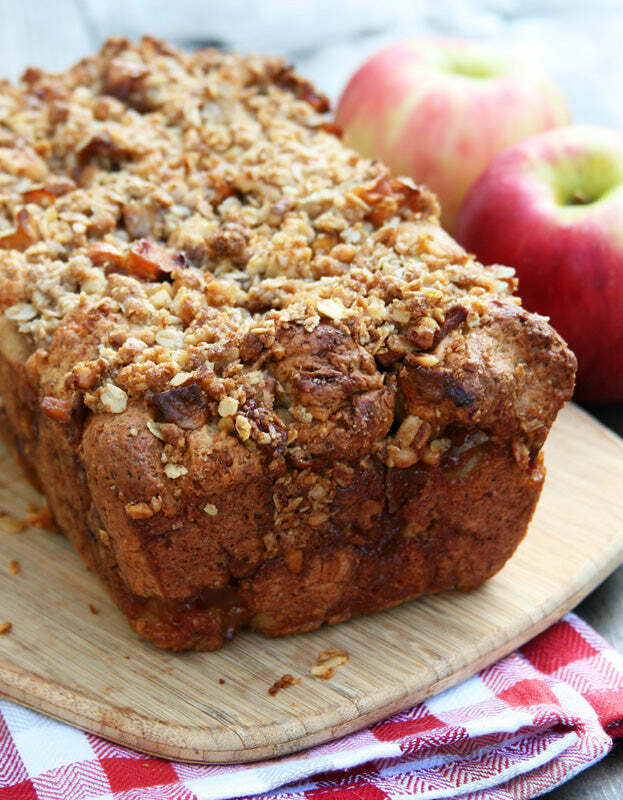 Everything irresistible about apple crisp can be found in this bread, from the juicy bits of cinnamon-laced apples to the sweet brown sugar and walnut crumble topping. And, not one, but three whole grains are also baked into this dessert-inspired bread, giving it a healthy twist- Hodgson Mill style. Begin by placing the flour, oats, milled flax seed, vital wheat gluten, sugar, salt and cinnamon into the pan of a bread machine. Add the margarine or butter, milk, and yeast and run the dough cycle for about 15 minutes or until the dough has been kneaded into a somewhat soft, but not sticky, cohesive ball. Add additional milk or flour as needed. The dough can also be made by hand or with a stand mixer equipped with a dough hook. Allow the dough to finish the cycle in the bread machine with a rise time of an hour and twenty minutes or until doubled in size. The combination of Hodgson Mill Naturally White Flour, White Whole Wheat Flour, Thick Cut Rolled Oats and Milled Flax Seed create a bread that’s healthy and delicious. 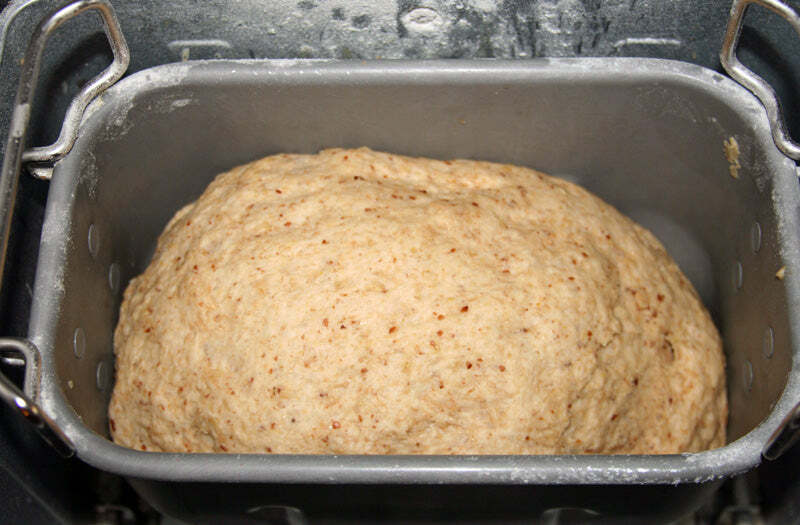 Adding a tablespoon of Hodgson Mill Vital Wheat Gluten contributes to the bread’s tender texture, but feel free to leave it out and substitute Best for Bread Flourin place of Naturally White for the same results. Also, the margarine can be replaced with butter if desired. Margarine (I like Land O Lakes®) adds to the shelf life of the bread, keeping it soft longer. Butter works just as well if you’re planning to consume the bread within the first day or two. Meanwhile, melt the butter in a large skillet and sauté the chopped apples, brown sugar, and cinnamon until the apples are crisp-tender, 2 to 3 minutes. Set aside to cool. 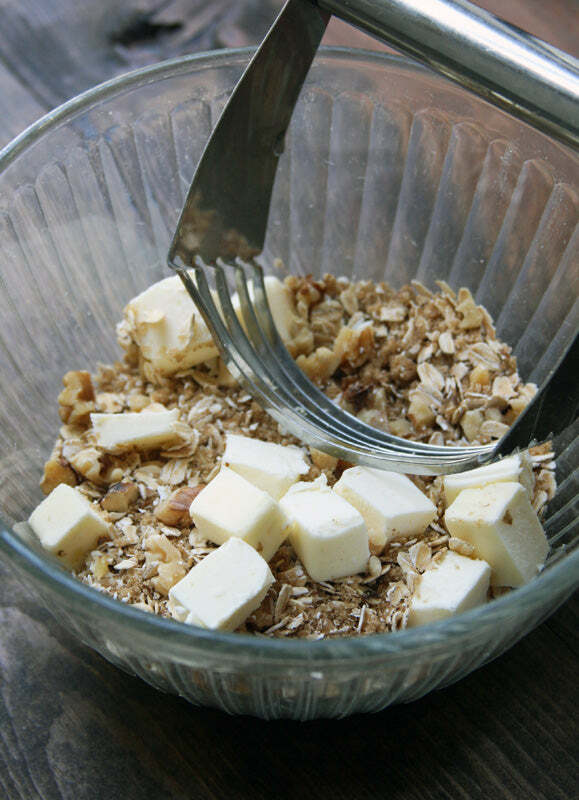 In a medium bowl, mix the brown sugar, oats, walnuts, and cinnamon together. Cut in the butter with a pastry blender, fork or fingers until the mixture resembles small pea-sized crumbs. 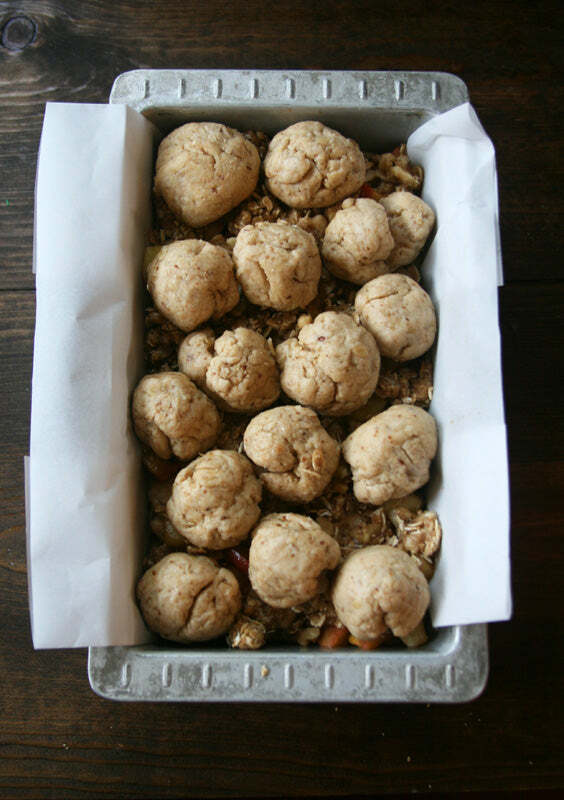 Place the streusel topping in the refrigerator until the dough is finished rising. When the dough is ready, remove it from the bread machine and split it into two equal portions, placing each onto a lightly floured work surface. 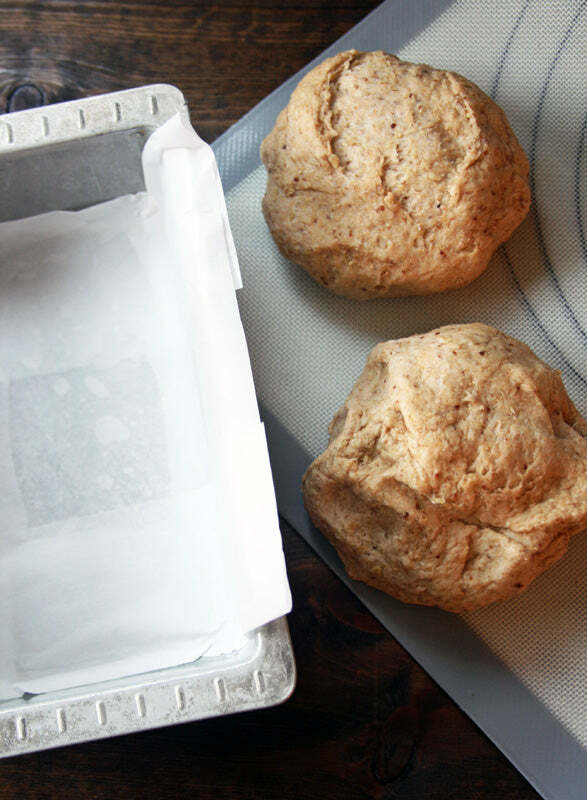 Line a standard-size bread pan with parchment paper and spray with non-stick cooking spray. Be sure to leave enough parchment paper hanging over the sides of the pan to assist with removing the bread once it’s finished baking. 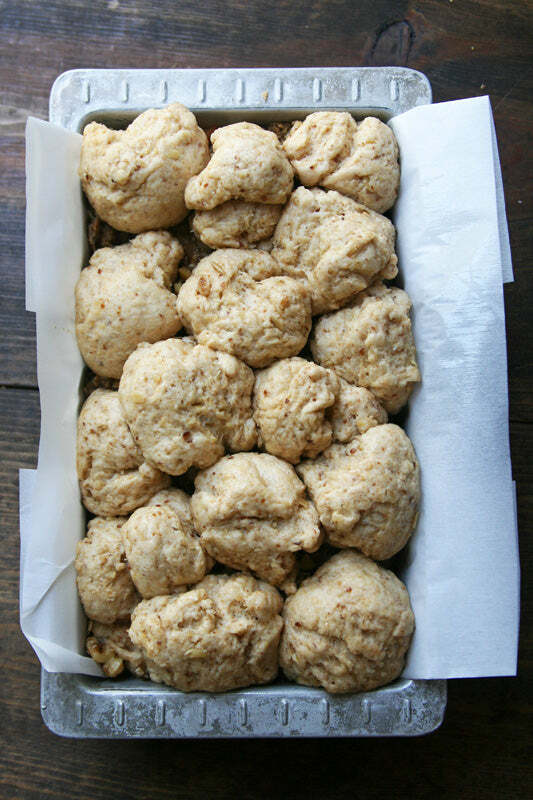 Divide one portion of dough into 1-to 2-inch pieces and roll into balls. Place the balls into the bottom of the pan. Next, scatter half of the sautéed apples over the dough and then top with half of the streusel. Roll the remaining portion of dough into balls and place over the toppings. Lightly cover the dough with plastic wrap that’s been sprayed with non-stick cooking spray and set aside in a warm spot in the kitchen for an hour to rise. 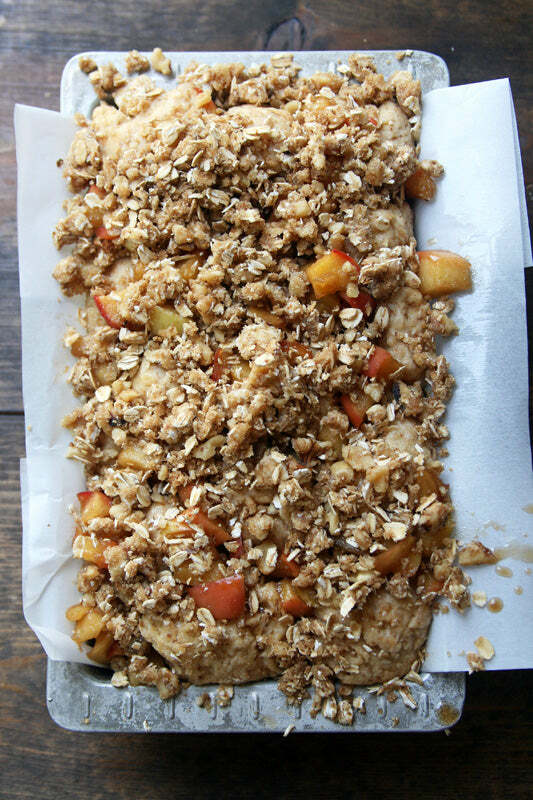 Put the remaining apples aside and place the leftover streusel back in the refrigerator. Once the dough has risen an inch above the rim of the bread pan, gently layer the remaining apples and streusel over the top and bake in a 350°F oven for 50 minutes to an hour or until an instant-read thermometer registers 190°F in the center of the bread. If the top begins to over brown, place a piece of aluminum foil loosely over the bread – start checking around 45 minutes into the baking time. I also recommend having a cookie sheet below the bread pan to catch any toppings that may fall off while it’s in the oven. 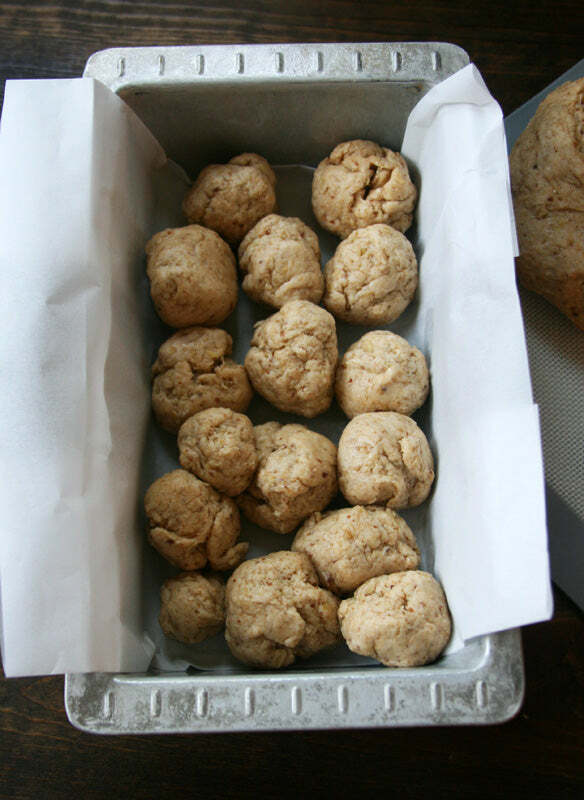 Allow the baked bread to cool for 10 minutes in the pan and then, using the parchment paper as handles, lift the bread from the pan and transfer it to a wire rack. Carefully slide the paper out from underneath and allow the bread to finish cooling. The bread must be completely cool before slicing, or the pieces of dough may separate – kind of like monkey bread. Once cooled, the loaf is easily cut into slices. Store cooled bread in an airtight container for up to four days. Best eaten within the first two days. Leftovers make excellent French toast. Picking apples is one of our favorite ways to celebrate the changing seasons and baking them into tasty treats is part of the fun. 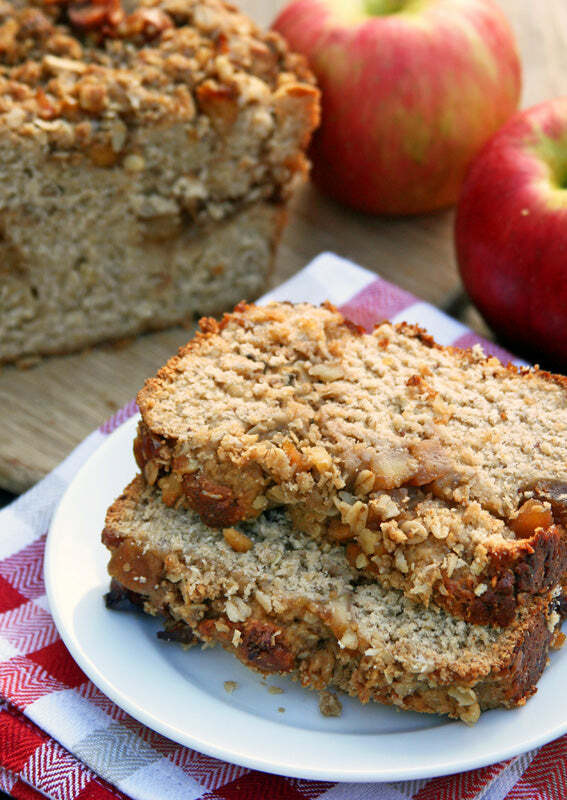 It’s a challenge to choose our favorite apple recipe (our blog has so many! ), but Whole Grain Apple Crisp Yeast Bread is definitely at the top. 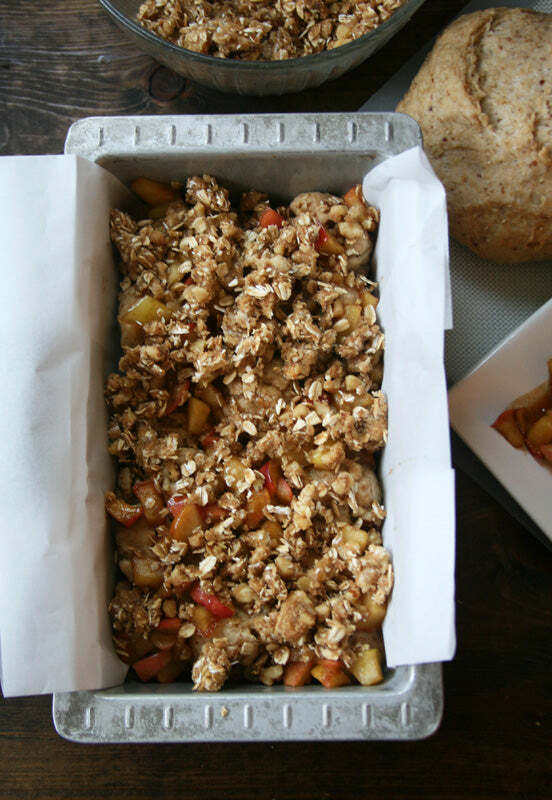 Gather up some fresh fall apples and get baking. I can’t wait for you to try this bread! Enjoy! 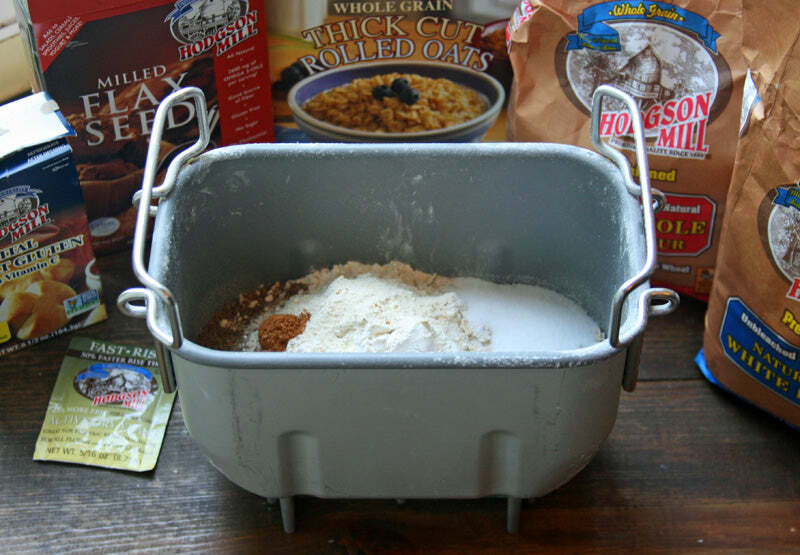 Place the flour, oats, milled flax seed, vital wheat gluten, sugar, salt and cinnamon into the pan of a bread machine. Add the margarine or butter, milk, and yeast and run the dough cycle for about 15 minutes or until the dough has been kneaded into a somewhat soft, but not sticky, cohesive ball. Add additional milk or flour as needed. The dough can also be made by hand or with a stand mixer equipped with a dough hook. 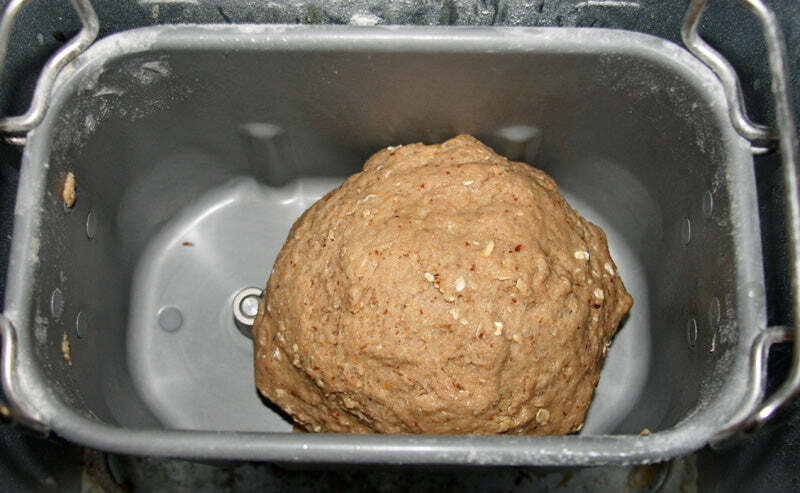 Allow the dough to finish the cycle in the bread machine with a rise time of an hour and twenty minutes or until doubled in size. 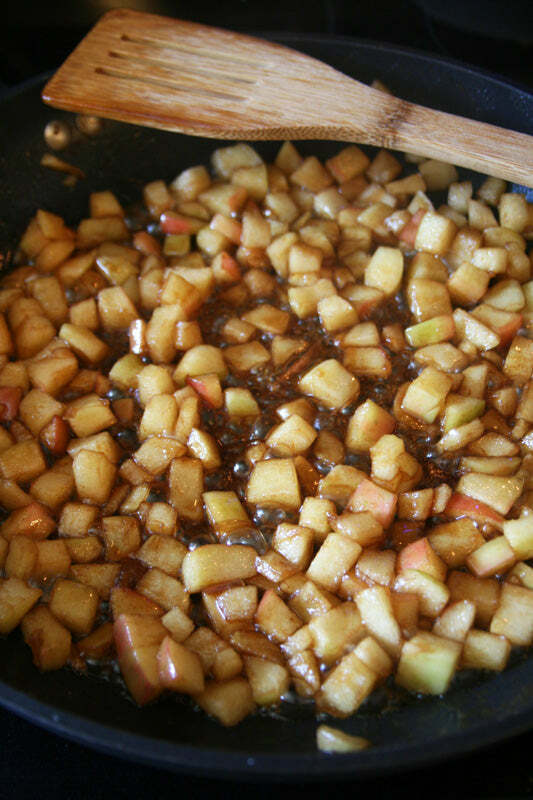 Melt the butter in a large skillet and sauté the chopped apples, brown sugar, and cinnamon until the apples are crisp-tender, 2 to 3 minutes. Set aside to cool. Remove the dough from the machine and split it into two equal portions, placing each onto a lightly floured work surface. Line a standard-size bread pan with parchment paper and spray with non-stick cooking spray. Be sure to leave enough parchment paper hanging over the sides of the pan to assist with removing the bread once it’s finished baking. Divide one portion of dough into 1-to 2-inch pieces and roll into balls. Place the balls into the bottom of the pan. Next, scatter half of the sautéed apples over the dough and then top with half of the streusel. Roll the remaining portion of dough into balls and place over the toppings. Lightly cover the dough with plastic wrap that’s been sprayed with non-stick cooking spray and set aside in a warm spot in the kitchen for an hour to rise. Put the remaining apples aside and place the leftover streusel back in the refrigerator. Once the dough has risen an inch above the rim of the bread pan, gently layer the remaining apples and streusel over the top and bake in a 350°F oven for 50 minutes to an hour or until an instant-read thermometer registers 190°F in the center of the bread. If the top begins to over brown, place a piece of aluminum foil loosely over the bread – start checking around 45 minutes into the baking time. Margarine can be replaced with butter if desired. Margarine (I like Land O Lakes®) adds to the shelf life of the bread, keeping it soft longer. Butter works just as well if you’re planning to consume the bread within the first day or two. I recommend having a cookie sheet below the bread pan to catch any toppings that may fall off while it’s in the oven. You can find Whole Grain Apple Crisp Yeast Bread and other recipes from Hodgson Mill by visiting the Recipes page. Receive monthly offers, recipes, and more in your inbox. Plus, get a coupon code for $5 off your first order of $25 or more in our online store!